My aunt Becky is a true SuperMom. She is my Yoda and Mr. Miyagi, my mentor and hero. She has been an amazing stay-at-home momma of 7 awesome kids for the past 18 years, during which time she has done countless crafts, kissed bajillions of boo-boos, home schooled, read thousands of stories, and cleaned more stains out of adorable outfits than she cares to remember, I'm sure. 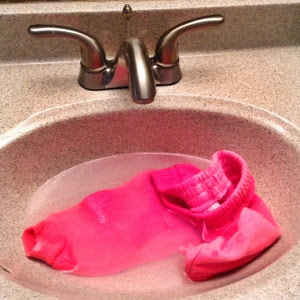 When I first became a momma, she passed on a laundry secret that she had only just recently accidentally found. 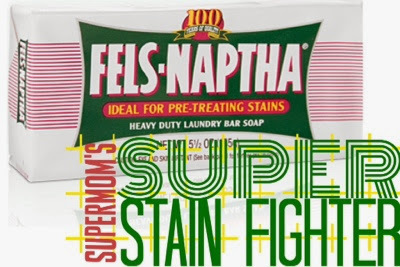 That no-fail stain remover, miracle in a bar form, super cheap and super old school tip was Fels-Naptha. 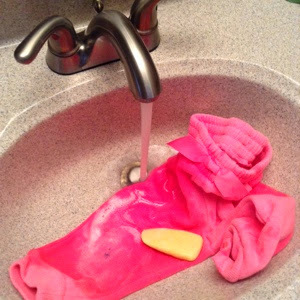 Becky originally bought the soap to make her own laundry soap (I told you she is amazing,) like the Duggars, but decided to try it on a particularly tough stain and, voila! Gone like magic. I've tried this stuff on every kind of stain--baby poop (anything that removes baby poop deserves it's own post, right?) berries, blood, chocolate, carpet stains, paint, you name it. It's even worked on a few stains that I didn't notice until they had already been washed and dried. It's seriously a miracle. And if you have a Kroger near you, it's in the laundry soap aisle for less than $3. I've been using the same bar at least once a week since my aunt Bea told me about it over a year ago. Wanna see it in action? 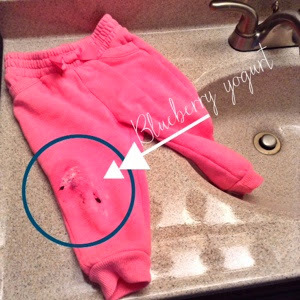 Kinley just happened to smash some of her breakfast yogurt on her sweatpants this morning, which made me think to pass on this tip. Thanks, SuperBaby. I just buy her the organic french vanilla whole milk yogurt in the giant container and mix in different fresh or frozen fruits myself, which is usually handy and perfect, but on blueberry yogurt day she always manages to mush at least a couple of those super-stainy things on some part of her outfit. I just keep a little square container in the bathroom at all times with a scrub brush and my bar of miracle soap. The only thing I do is get the stains wet under warm water and rub the bar vigorously on them until they are saturated with soap. Sometimes the stains change color, especially on white clothes, which seems like isn't a good sign, but I've never had one that changed color not come out, so don't panic. You can let it soak for as long as you want. I've left things for hours when I've gotten busy and forgotten about them, but I would say you probably wouldn't wanna do it any less than 30 minutes. When you get back, the water usually has a film on top. Not sure why, looks gross, but again, it's not a bad thing. Just wring them out and take a peek. If you still see any staining, just repeat the process and this time scrub the stains with a nail brush or something like that before soaking again. These pants came out perfectly without extra scrubbing, which is usually the case. TA-DA!! 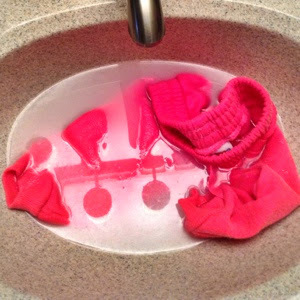 After you are satisfied that the stain has been obliterated, just throw them in the wash with everything else. Easy-peasy. 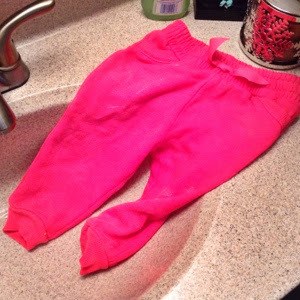 Fels-Naptha has saved so many of Kinley's cute tiny little clothes over the months, it wouldn't be right to keep this miracle laundry secret to myself. I'm thinking about throwing a bar of it in every baby shower present I give from here on out. It's like my duty. Kind of like pay it forward in a poo/vom/blueberries removal way.